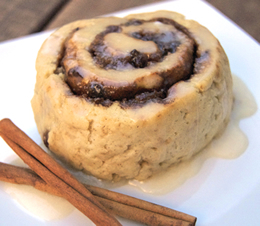 The biscuit dough makes these cinnamon buns nice and flaky and keeps them from drying out. Thanks to Jenny from Savour the Senses for this wonderful creation! In a large bowl, whisk together the flour, baking powder, baking soda and salt until well combined. Add the butter and fold into the flour mixture until it forms small crumbs. Pour in the buttermilk and stir slowly until the dough forms into a ball. Knead the dough over a lightly floured surface until well formed (about 3 minutes), then roll out into about a 9×16-inch rectangle. Spread the 2 tbsp softened butter over the dough. Next, cover with brown sugar, cinnamon and raisins. Tightly roll the dough into a spiral across the longer side. Press the seam to seal the buns, then gently cut the dough into 1½ inch pieces. Place the rolls on a baking sheet lined with parchment paper. Bake at 500F until sugar is bubbling and the buns are golden around the edges (about 8-10 minutes). While buns are baking, beat together the powdered sugar, 2 tbsp buttermilk, 1 tsp melted butter and vanilla until a stiff glaze is formed. NOTE: Add more buttermilk if you would like a less-thick glaze. Remove the buns from the oven and coat with the buttermilk glaze before serving. TIP: For extra tasty cinnamon buns, place them into a sealed container for 30 minutes to 1 hour after frosting, before serving.